Search for information about the genre "mystery novel" and write down a brief defenition from what you find. Then briefly say how the start of our novel fits in with this. Also, give your impression of the novel so far. Does anything strike you as odd or puzzling? A mystery novel is a genre of fiction, and there are usually detectives solving crimes. Because detectives works by logic there are rarely supernatural elements in the novels. In a mystery novel there are often clues to be found throughout the book, and the mystery is solved at the end. The book does have a crime and a detective, and he most certainly relies on logic! There aren't any supernatural elements included, but if the mystery will be solved has yet to remain. So far I find the authors way of writing to be boring, because he does not vary and he has close to zero descriptions. But I do enjoy the facts that he has written in between the storyline. I enjoy them because I know everything is true, and they are all things that you wouldn't normaly think about. A mystery novel is a subgenre of fiction. It's a novel in which a person (the detective) investigates and solves a crime mystery. The plot is centered around a crime, normally a murder. The novel's central conflict is between someone trying to solve the crime and the criminal's efforts to cover his or her tracks. Like Joakim said there are often clues to be found to the reader who can make their own theory and be a little detective for a while. The book have a crime, the incident of the dog in the yard, and Christopher himself is "playing" a detective. I like the book, mostly because of the maincharacter, Christopher. The author spices the story with funny and interesting facts. I have to admit, it was a bit boring to start with. It's easy to imagine that it's a child, and maybe even a special child, writing the story. I think it's well written. I don't find anything odd or puzzling, yet! A mystery novel refers to any full-length fiction work that involves a crime. Sometimes the protagonist is a member of the police force and sometimes it is simply a concerned citizen, but the mystery novel involves the investigation of crime and the justice brought to the criminal. We have definitely got a crime here, and Christopher has certainly made a good start of pursuing the perpetrator. Nothing is currently striking me as puzzling, but who knows, something odd might show up later in the book. Mystery novels are fictional books that are able to be classified in the "mystery" genre, typically revolving around a crime of some sort. Detective fiction is a well-known type of mystery novel, wherein the reader observes a detective attempting to solve a crime, such as a murder or kidnapping, throughout the course of the plot. The novel fits in with this definition, because the reader observes Christopher Boone as a "detective" trying to solve a mystery, namely the murder of the dog. I'm usually not that person reading books like this, but I have to say that I do like this one. I think the book is quite interesting to read, especially because the reader get an insight into how it actually is to be a teenager living with Asperger syndrome. Reading in his point of view gives me a deeper understanding of the syndrome and why people like Christopher feel and think the way they do. I also agree with Thale, I like that the author spices the story with these funny and interesting facts. I also like the variation in the book, because we get to read about Christopher as a detective, but also about his past and and his inner thoughts. A mystery novel is a fictional genre, also known as a detective novel. In this genre the plot mainly circles around a detective (either professional or unproffesional), trying to get to the bottom of an unsolwed case. Even though a mystery novel is a work of fiction, authors often find inspiration in real crimes people have committed or simply mysterious things that has happened. In a mystery novel, many times we follow the story told, or following in other ways; "the good guy" in his struggle to follow the path of trails or clues that the villain has left behind after committing his crime. In this book we follow Christopher as the good guy, (seems like that so far) the dog is the victim of the murder, and so on. So far I like how the book has a very special angle to how we are fed info, but I don't feel comfortable with the writingstyle just yet. Also I think the book captures the reader very well for the first few pages. A mystery novel is a genre of fiction, and there are usually detectives solving crimes, the part played by Christopher in the book. Because detectives works by logic there are rarely supernatural elements in the novels. In a mystery novel there are often clues to be found throughout the book, and the mystery is solved at the end. the good guy in this story being Christopher struggles to find out who the killer is, not just because he’s got nothing to go on, but also because he finds it hard to talk to people he doesn’t know. i think the fact that he does face his fears makes him "better" and gives him a new kind of self confidents. i think the book is brilliant! i have read it before but it is just as good this time, something i find very refreshing. i think that is a reason why the book is so good, because you can read it again and again without getting tired of it. A mystery novel is a genre of fiction. It is almost the same as detective fiction and crime fiction, and they are often used as synonyms. Novels and short stories is often written in this genre. In a mystery novel there is often a crime to solve, and someone doing detective work and solves the mystery. Sometimes a mystery novel can be about thriller mysteries where the solution often is non-logical. But mystery novels is almost like puzzles, the reader has to pick up clues. The beginning of this book isn`t very mysterious. You immeditely understand that the dog has been killed and that Cristopher tries to find clues about the murderer. It became more exciting to read after a few pages. It is an interesting book, with Cristopher`s special thoughts. A mystery novel is a loosely-defined term that is often used as a synonym of detective fiction, in other words a novel or short story in which a detective (either professional or amateur) solves a crime. The term "mystery fiction" may sometimes be limited to the subset of detective stories in which the emphasis is on the puzzle element and its logical solution . The novel fits in with this definition, the book have a crime, the dead dog in Mrs.Shears garden, and we do have a detective, which is Christopher pretending to be a detective. I think this book is very good, so far so good! And I agree with Julianne, the book is quite interesting , because the reader get an insight into how it actually is to be a teenager living with Asperger syndrome. So, I think that this is a book I will enjoy. As Julianne and Thale did mention; the author spices the story with these funny and interesting facts, and it makes the book even more interesting to read. So I'm looking forward to continue reading this book. The mystery fiction genre, also called detective fiction can be described as a novel or short story where the plot circles around a detective, either amateur or professional, who tries to get to the bottom of a mystery. Bad things are always in store for the detective, and we get to take part in the prosess of solving the crime. The way the author expresses himself/herself through writing opens up for the readers to make up a solution on their own. This book fits under the mystery genre, because we do have a crime, and in this case Christopher is the detective trying to solve the case. Secrets will along the prosess reveal themselves to Christopher, and if there's some danger in store for him is yet to find out. The story seems exciting, and I'm eager to find out what happened the night of the murder. The way the book is written makes it quite hard to read, and the chapters don't seem to fit together. I find the father kind of odd, because he seems so secretive and mysterious. I look forward to reading more, and finding out if I'm right. The mystery novel is a genre of fiction, and is also known as a detective novel. In these novels a detective tries to solve a crime mystery. The tension in this genre is created by a mystery and a logic solution. During the novel, the reader could make up their own solution, which makes it even more interesting to finish reading the novel. In the novel The Curious Incident of the Dog in the Night-Time, we have a murder mystery and a detective trying to solve this. Therefore, this novel fits under the mystery genre. I really like this novel so far. Like some of my fellow students above, I like that the reader get some information on how it's like to be different. Actually, I find Christopher's syndrome more exciting than the mystery. His interpretation of life makes the book even more fascinating and funny. So far I can clearly see that this is book is a mystery novel, we have the murder mystery and we have the detective trying to solve the it. The book is really exiting to read, you have as Ingrid mentioned Christopher's Asperger Syndrome that I think is fun to read about. Especially how he looks at life and how he finds different ways to solve problems he gets in to + you have the mystery going on too, this can't be any better! I give a thumbs up for this book so far! A mystery novel is a genre of fiction and the plot is often about detectives and crimes. If you read many books written in the mystery novel genre, you could see that it’s often a detective that plays the good guy and solves the crime. Although the book is a genre of fiction, it isn’t impossible that the plot in the book could have happened in real life. The book now begins to include the detective, Christopher, and his way for trying to solve the crime. The crime has been there from page 2 of the story, but Christopher has been involved in the book as a detective on a later stadium. I think I’m the only one that has said this about the book, but I think it’s pretty boring. I like books with some action or history, but that isn’t one of the themes of this book. The genre mystery novel could have contained action, but I wouldn’t call it action when the only thing so far is that Christopher found a dog that has been killed with a fork. The thing which is positive with this book and I think it has been mentioned before, is that you get to know how people with the Asperger’s syndrome live their lives and different challenges and possibilities for them. A mystery novel is a fictional book that usually contains a crime of some sort, but, in some cases the book can be non-fictional. A well-known type of mystery novel, is detective fiction, wherein the reader reads about a detective trying to solve a crime. The crime could be for example a murder or kidnapping. A mystery novel is a fictional book, containing some sort of a mystery. This mystery will be solved by one or more characters through out the book and we usually get to follow the main character in the process of solving the mystery. 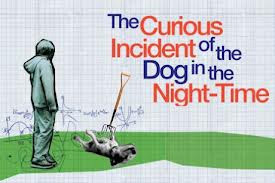 Compared to other mystery novels, "The Curious Incident of the Dog in the Night-time" isn't building up the tension level in the same way, but I still think reading Mark Haddons novel is as exciting as reading other mystery novels. Mystery is a genre of fiction in which a detective, either an amateur or a professional, solves a crime or a series of crimes. Because detective stories rely on logic, supernatural elements rarely come into play. The detective may be a private investigator, a policeman, an elderly widow, or a young girl, but he or she generally has nothing material to gain from solving the crime. Sub-genres include the cosy and the hard-boiled detective story. Mystery novels are often satisfying to many readers because they know that everything will be resolved in the end. An example is Agatha Christies novels Miss Marple. I've really enjoyed the book so far. Reading it twice is seriously not a problem. I love how Chris takes notice of details. His thoughts are also very amusing and it's easy to picture him in the different scenes, in other word it's a very easy book for me to read. Haddon has done splendid work so far. A mystery novel is a novel in witch a detective tries to solve a crime or several crimes. The book really seems to be a different kind of mystery novel. It seems that it is just as much about Christopher's life and how it is to be living with the Asperger Syndrome, as it is about solving the actual crime. I have really enjoyed the book so far, it is very original, and nothing like I have read before. A mystery novel is a novel or a short story in which a detective investigates and solves a crime mystery. The detective can either be professional or amateur. Sometimes mystery books are nonfictions, and in certain situations the term “mystery novel” may refer to a different genre. The novel fits in with this definition, because Christopher appears as a detective who tries to solve the mystery of the death of Wellington, his neighbors puddle. I have some mixed feelings about the novel. Some chapters doesn’t interest me as much as others, for instance when he writes about his favorite film etc. Still I’ve never read a novel of this type before, and as some of my fellow students I also find Christopher’s syndrome more interesting and exciting than the mystery itself. First of all, I want to say my upinion. A mystery novel is a novel in which the reader is challenged to solve a puzzle before the detective explains it at the end. Mystery is a genre of fiction in which a detective, either an amateur or a professional, solves a crime or a series of crimes. Because detective stories rely on logic, supernatural elements rarely come into play. The detective may be a private investigator, a policeman, an elderly widow, or a young girl, but he or she generally has nothing material to gain from solving the crime. Subgenres include the cozy and the hard-boiled detective story. A mystery novel is a novel where the story is about crime or a mystery that should be solved. Often are the mystery novels exiting and a kind of scary. As far I have read I think the book is very different from other mystery novels. I am used to read about detectives, not a little boy with “needs”. Often have the mysteries been more severe than a dead dog (I am not saying the death of the dog is not important). In a mystery novel we are faced with a crime that the main character in the book will, hopefully, get to the bottom of. The author "challenges" the reader in a way to try and figure out the clues before the main character does, which differentiates it from other literary pieces. This book fits in with this description. Something this book has that I've found kind of weird or odd, is that we are inside the mind of a child with asperger's syndrome. I find it kind of annoying to read, because the way he formulates himself and generally how it's written I think is annoying. A mystery novel is a novel in which a detective tries to solve a crime or several crimes. The reader is able to take part in the process of solving the crime, as well as the detective. This book fits in with this description. I have some mixed feelings about the novel. I've found it kind of odd and annoying to see the world through the eyes of a child with Asperger’s, although it is this that makes the book so great.